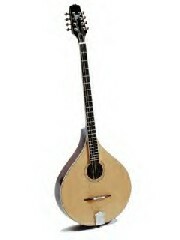 The bouzouki, a Greek instrument, was introduced into Irish music in the late 1960’s. Similar to the mandolin, it is a beautiful stringed instrument, but it is a long necked lute and is played with a plectrum. Shop our selection of quality bouzoukis at our store or online.